5. 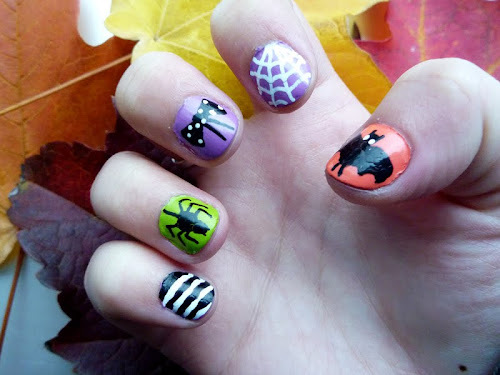 These adorable Halloween nails! I think I am going to put some spiderwebs on mine. Great idea! 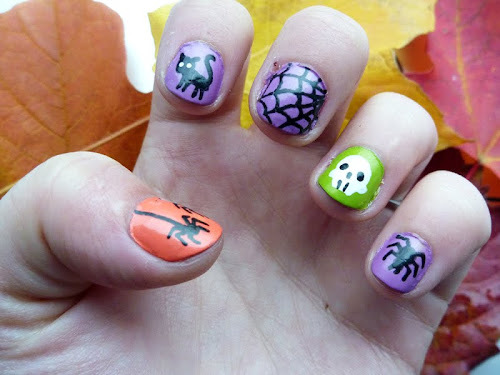 Angel has a lot of cute nail designs on her blog. 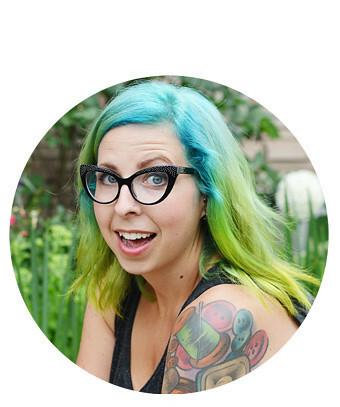 And I also found this awesome site that she mentioned in one of her posts! 4. This dress is perfect! And what a cute name! 3. This outfit post idea! Brilliant. It is a 'Then vs Now' thing. On the left is how Andrea wore a denim button up when she was a kid and on the right is how she wears it now. So cute! I really want to try this, I was a hilarious dresser when I was a kid (and I kind of still am). I think that falls under the "NEED" category! I love it so much! What are your plans for this lovely Friday? OH MY! Those nails are OUTTA CONTROL! I wish I could do that! I love that then + now photo! And that pen holder is TOO cute!!! Have a wonderful weekend! My hands shake waaaay too much to be able to do any sort of nail art! Haha. I have a hard time painting my left hand as it is! ;) Cute naislt hough! "I'm such an adult." lol. Since it's kinda cool here in Tennessee,I plan on trying to stay warm and watching Halloween themed movies tonight with my husband. Yay! those pumpkins are the cutest I've ever seen! That nail art is darling -- but I do not have the necessary motor control in my left hand to do it myself -- it would come out looking crime scene scary, not cute scary. number 3 is such a great idea!! That dress is gorgeous! As is that kitty pen/pencil holder - d'awwww! I love love love times a million those nail designs!! Makes me wish a little bit that we did Halloween here in Australia more. Question though, how do you get such detailed designs? Is there a special trick? I love the nails for halloween they are so cute! that owl pumpkin is oh so cute and i really love the then vs. now! i know for sure my style has grown so much from when i was little. i need to get my hands on some old pictures of me!